Here is my recipe for perfect pancakes. Throw out the Bisquick and grab your own flour, eggs, milk, and a few other “secret” ingredients (which are very humble and normal), and I’ll tell you how to create a light, golden brown pancake with the perfect amount of crunch. Then go and feed your family a great breakfast, and you’ll be the hero of the day! Enjoy…..photo from 123rf.com. I wish I could make my photos look that good. Whisk together the flour, baking powder, sugar, salt, and cornmeal in a medium mixing bowl. Add the milk, egg yolks, and butter; stir in. Set aside, beat the eggs whites until peaks are stiff. 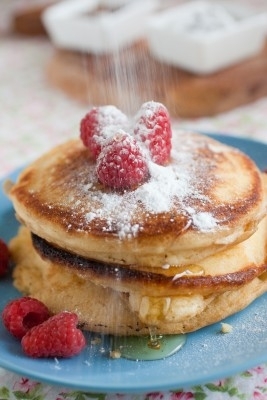 For pancakes to stay fluffy, stir in the eggs whites, but make sure you can still see a lot of the egg white clumps. It’s second nature to want to stir them until you can’t see them anymore, but don’t! Pancakes need all that air. Heat up a skillet or griddle, grease lightly, and measure out the pancake batter with a measuring cup…..this way they stay round and perfectly sized. Flip when you see the batter is filled with bubbles. Top with your favorite toppings when both sides are cooked.